"When the course is laid, and the anchor's weighed, a sailor's blood begins racing. With our hearts unbound and our flag unfurled, we're underway and off to see the world." So go the lines of our family's favorite sailing song, "Sailing for Adventure". 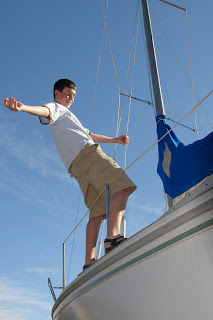 With our new-to-us Catalina 25 sailboat, the Unsinkable 2, sitting on a trailer in the driveway, we spent several weeks working to get her ready for sailing season. We had new cushions made, updated the electronics, added a cd player, depth finder, gps mount, and a new VHF. No problem though, because the younger kids had plenty to keep them busy on the ground. 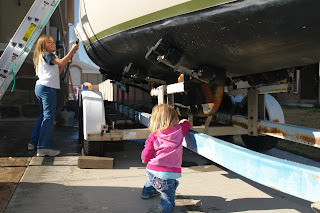 My #6 tried copying her big sister who was busy scrubbing the hull for waxing. Unable to reach the hull, #6 busied herself washing and re-washing the trailer, which was much easier to reach. I sat out a couple of spring rainstorms in the boat, checking for leaks. As a result we re-bedded all the deck hardware, and added backing plates to key structures. The biggest job was fixing the leaky aluminum windows. I started out with some automotive butyl tape, which was black and rather unsightly. Then the idea dawned on me to call an rv supplier. (Utah is a little short on marine supply stores). The RV dealer sold me a roll of RV butyl tape, which was a light gray and flat - much better suited to fixing the sailboat windows. 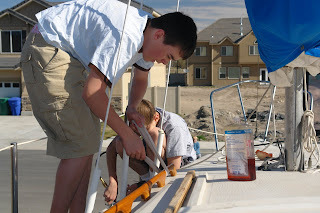 By the time the ice melted and the marina opened, we were more than ready for "splashdown." 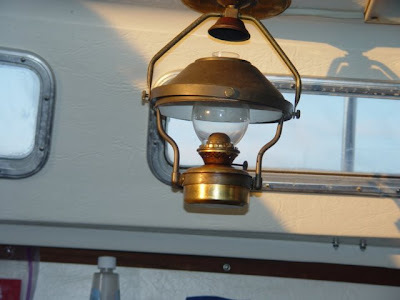 Here is the gymbaled oil lamp in our cabin.